Hey there denim lovers – I’m back from a short break and today I’m reviewing the Joe’s Jeans Shirtall. 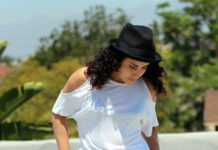 I’m always eager to review denim that isn’t the usual jean, and this Shirtall was an instant fave for me. It’s part of Joe’s Jeans’ Vintage Reserve Collection,which is truly amaze. I’m a vintage lover, so I’m all about a style of clothing or trend that comes back around, such as a great romper, jumpsuit, or overall. 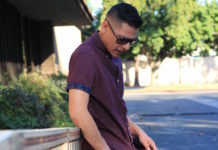 This Shirtall has a vintage appeal, but it fits today’s trends like nobody’s business. It’s awesome and I can easily see myself pulling it out of my closet and wearing it for years to come. This Shirtall encompasses so many great trends (utilitarian, western, etc. ), yet it’s such a classic denim piece. I vintage shop on the regular and I’ve seen great denim rompers such as this, so it’s always fun to see designers and brands that resurrect great, older designs. If you’re fond of overalls/jumpsuits/rompers or denim that has a vintage feel to it, then the Shirtall is a must-have for your closet. One of the biggest trends we’ve seen this year is the denim on denim look. This is when you pair a great denim or chambray shirt with your fave pair of blue jeans. This Shirtall gives the denim on denim look but the romper gives it a playful twist. The denim itself is a soft blue wash with sanding, grinding, and fading throughout. These techniques give the denim a worn-in vintage vibe, as if I pulled this right off a rack in a vintage or antique shop! The denim is comprised of 60% cotton and 40% linen which makes it super light-weight and easy to wear even during the hottest summer months. The denim is soft and the fit is loose, so wearing this feels like you’re wearing pajamas. It’s that comfy! It has pieced western yolk with a pointed back, and snap-flap pockets on the chest. The sleeves are long, but look equally great when cuffed and pushed up to the elbows for a laid-back, relaxed vibe. There are even belt loops, so if you want to style this with a great belt you have the option for a different look. It has back patch pockets and scoop hand pockets in the front (front pockets are always a must). The inseam is 4″, which was perfect on me, and I’m 5’10”. Whether you’re going for a 70’s boho vibe, or you’re after a minimal yet classic look, the Shirtall is effortless and oh so chic. 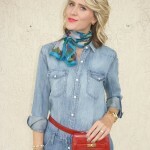 I chose to style mine with a trendy hip bag and a fun vintage scarf. I’m eager to pair it with some chic flats or white tennis shoes, and without a belt for a more laid back look. I also would love to style it with the shirt buttoned all the way up to the neck, for a nice, clean look. This Shirtall may seem pricey, but it’s definitely an investment piece that will give you tons of wear. The quality is amaze, and the comfort is undeniable. From day to night, and from summer to fall, this is a denim staple that is sure to turn heads.